Masa pest control officers at work ... with the construction boom in Saudi Arabia, demand for expertise has grown. Masa* entomologist MOHAMMAD ARIF HUSSAIN says that Saudi Arabia’s growing industrialisation has put the onus on pest controllers to tackle all kinds of infestations in and around the industrial premises. Following the decline in the economies of the developed world, many construction and infrastructure companies are broadening their horizons with Saudi Arabia having become a magnet for industrial investment. Saudi Arabia is the largest construction market in the Gulf region by some margin. Also the government has been making considerable efforts to diversify its economy which is driven largely by oil revenues. Hence, the country has witnessed rapid industrialisation with manufacturing industries ranging from sugar and textile to gas processing facilities – all of which require comprehensive pest control services to handle various pest infestation problems. Termite control constitutes a major portion of these efforts over large spans of Saudi Arabia, with most of the termite damage being caused by subterranean types. Authorities in Saudi Arabia and the other GCC countries have issued strict regulations on the construction of buildings. Every building project must employ termite services from a company of repute, one that is professional and specialised in the field. The most distinctive feature of subterranean termite damage is the presence of a brown mud-like material that lines the colonies in irregular patterns. A pest control inspector must thoroughly examine all underground areas of a facility including the basement and crawl space walls, supporting piers and beams, sill plates, floor joists, and sub floors. Particular attention must be paid to areas where concrete steps, porches, or concrete slabs join with the structure. • Ensuring that siding, brick veneer, or foam insulation does not extend below the soil grade. • Soil treatment: This establishes a termiticide barrier under and adjacent to a building. A continuous barrier must be established along the inside and outside of the foundation wall, under slabs and around utility entrances. A vertical barrier is established in the soil by trenching or trenching and rodding along all sides of foundation elements such as foundation walls, chimney bases, pilasters, and pillars. The trench must be at least six inches in depth. Termiticide is applied from the top of the grade to the top of the footing or to a minimum depth of 30 inches. Where drain tiles, French drains, or other foundation drainage systems present a risk of contamination outside the treatment zone, treatment shall be performed in a manner that will not introduce the termiticide into the drainage system. Where footings are exposed, the treatment is performed next to the footing but not below the bottom of the footing. Soil around sewer pipes and conduits and all other structural members in contact with the soil must also be treated. Post construction treatment, like preconstruction, depends on the type of building construction. This treatment is usually done by drilling and injecting plus application of dusts or gel and other type of formulation – and sometimes trenching and rodding whenever applicable – to eliminate existing termite infestation within the structure. It is important to have a continuous complete chemical barrier that will block all possible termite entry points through the foundation expansion joints, outside perimeter walls and cracks in the flooring/foundation walls and footings. Knowledge of the type of construction will allow the correct application of termiticides and ensure satisfactory results. 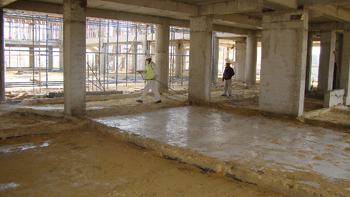 Slab construction is the most common type of construction in Saudi Arabia and should be given due consideration in respect to the particular type or architectural façade of the building. • Short/long rodding: Here, termiticides are placed under the slab with the use of a short rod or a long rod injector going through a drilled hole that penetrates the slab or the foundation wall. To ensure success, it is necessary to locate the bottom of the slab accurately for placement of the holes. Holes drilled too low will leave an untreated layer of the soil above, which will be prone to termite infestation. The slab can be precisely located by taking the inner height from the window sill down to the floor. This measurement should then be marked on the outside wall, which gives the location of the slab. A total of the inner height to the floor plus the slab thickness indicates the bottom of the slab for accurate placement of the holes. Warehouse constructions in the kingdom are of different types. Some are constructed with asphalt flooring and in-situ concrete slabs, or poured or fabricated concrete blocks. Poured concrete blocks as well as fabricated concrete blocks often have expansion joints between blocks, which will need a zigzag pattern of vertical drilling along the expansion joints between blocks. It is not advisable to drill directly along the expansion joints due to the possibility of spills and waste of chemicals on the unfitted rubber stopper on the joint. For termiticides that have a repellent action, termiticide-treated sand could be used to fill the expansion joints to achieve good control. To ensure the success of its treatment procedures, Masa Establishment for Pest Extermination Services has recently started using Raslan Plus 30.5 per cent termiticide, which has Imidacloprid as the active ingredient. It is odourless, undetectable by termites, and colourless when mixed with water. It offers effective residual performance that provides protection against reinfestation of treated areas for a number of years. *Masa is a pioneer in pest control and management in Saudi Arabia and has tackled problems related to all types of pests. The company has an in-depth knowledge of the way insects live as well as the safety measures in controlling insect pests, having successfully treated and saved thousands of factories, dwellings, buildings, museums, antiques, wooden frames and other similar materials made of wood. Its treatment methods are based on 35 years of dedicated service to the public and environment. Masa uses world-class equipment, pesticides, fumigants and integrated pest management (IPM) products in its services to maintain a safe and secure environment.